>PLEASE NOTE: Sometimes the process of uploading products changes the colors of images in thumbnails and previews. The actual file is NOT neon. 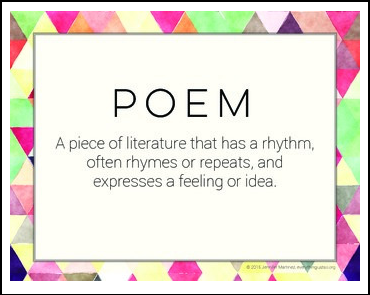 These Figurative Language Posters were designed for use with my Poetry and Figurative Language Mini-unit, which was created for a group of students who needed extra practice with fluency and a beginner’s understanding of poetry. Each day provided a quick lesson on one characteristic or type of figurative language, multiple readings of a short poem, and practice using the term of the day. The Figurative Language Posters served as a reminder of important terms while we studied. © 2016 Jennifer Martinez, everything just so. All rights reserved. License permits individual use in single classroom only. To share with friends, please purchase additional licenses at half the original price. No part of this work may be reproduced in any way or by any means without expressed written consent of the author. Thank you for helping to protect my work!